A breed is defined as a group of animals with a common origin. But equine breed classifications can be the subject of much debate. Each group or horse breed classification has definite breed characteristics not commonly found in other breeds. These breed characteristics are fixed in the genetic makeup of the equine breed and will be passed from parents to offspring. Common horse breed classifications are as follows. The stock horse is short-coupled, deep-bodied and well muscled. They were developed to work cattle, and often will compete in rodeos. The Quarter Horse, Appaloosa, Arabian, Paint, Morgan or P.O.A. usually predominate stock horse breeds. Their easy-going gaits are the walk, jog and lope. Horses of this type are found in all light breeds. Their walk, trot and canter are popular for pleasure riding. English pleasure horses are usually more angular than stock horses and have more extreme style and action. Some of the popular breeds are Saddlebred, Morgan and Arab Horse. A hunter is a large, clean-cut horse bred for cross-country riding and jumping. It moves boldly and briskly and has a long purposeful stride. They are usually Thoroughbreds or crossbreds selected for stamina, speed and surefootedness. Ponies are small horses of less than 14.2 hands in height at maturity. Most common are the Shetland and the medium-sized Welsh pony. These two breeds are often crossed with Arabians, Morgans and other breeds of light horses to produce larger, more spirited ponies. The POA is the result of cross breeding an Appaloosa with a Shetland. Hackney ponies are noted for their high trotting action and light carriage use. The popular horse breed classification that includes equine breeds such as Anglo-Arab, Holsteiner, Trakehner and Hanoverian. These equine breeds are popular for use in dressage, jumping, combined training and combined driving. Warmbloods combine Thoroughbred and Arabian blood with draft breeds. These horses have a unique gait that results in a smooth and rhythmic comfortable ride. Each breed has a specific synchronous lateral gait that is characteristic to the breed. 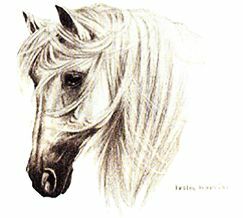 Some gaited breeds are Paso Fino, Peruvian Paso, Tennessee Walking Horse, Missouri Fox Trotter and Rocky Mountain Horse. Horses belonging to a specific breed with registration papers documenting the horses ancestry. Some registered breeds are considered purebreds. Other breeds of horses have open registries. A crossbred horse is a horse that combines the characteristics of two or more horse breeds. Coloured breeds are bred for their coat colors or markings. Some color breeds are Pintos, Palominos and Buckskins. These horses can sometimes be registered with more than one association. Draft horse breeds are heavily muscled horses used as workhorses. They stand 16 hands or taller and weigh 1,600 pounds or more. Breeds of draft horse include Percherons, Belgians, Shires, Clydesdales and Suffolks. This ones for you first naproxen sodium tablets usp 220 mg time dads feeling less confident..